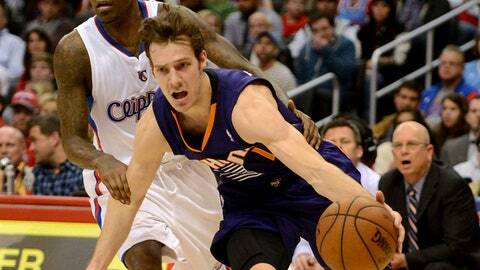 Goran Dragic drives to the basket for two of his game-high 26 points in the Suns' 107-88 victory over the Clippers. LOS ANGELES (AP) — Jeff Hornacek and Doc Rivers played against each other for 13 seasons in the NBA. This was the first time they matched up as head coaches in a game that counted, and Hornacek’s Suns gave the Clippers a not-so-subtle reminder of how quickly turnovers can turn into fast-break points. Los Angeles went up against a team that began the day averaging a league-best 19.1 fast-break points and allowed 18 for the game. Phoenix scored the first nine points, seven off three Clippers turnovers. The Suns converted 20 turnovers into 20 points overall, including a three-point play by Dragic that gave them a 45-34 lead with 4:55 left in the first half. "I think we did a good job of being really unselfish and looking for each other," said Channing Frye, who put the clamps on Griffin following his 40-point effort against the Jazz on Saturday night. NOTES: This will be the first time in franchise history that the Clippers make it to New Year’s Day without a losing streak of more than two games in a season. … Griffin has drawn a league-high 123 fouls. The Suns fouled him six times. … None of the Clippers’ other 11 losses were by more than 14 points. … Los Angeles center DeAndre Jordan played 21 scoreless minutes in the first half with 12 rebounds. He finished with two points and 19 boards. … The Clippers took their only lead, 14-13, on a pair of free throws by Griffin.